Lamium, commonly called “dead nettle,” is a trailing, groundcover perennial. The name “dead nettle” refers to the fact that lamium does not have the stinging hairs characteristic of other nettles. Native to Europe and western Asia, lamium is frequently found naturalized along woodland trails and paths and colonized along the banks of streams. Its variegated leaves and colorful spring flowers make lamium a reliable choice for brightening shady garden spots where few other perennials will grow. This lamium cultivar is the one most commonly grown in home gardens. Spotted dead nettles have white or silver centers edging dark green foliage. Leaves are typically heart-shaped with softly serrated edges and a quilted appearance. Pink, rose, purple or white flowers resembling tiny snapdragons are produced in clusters or whorls that bloom from April through June and again in September. Spotted dead nettles range in height from 6 to 12 inches and are grown primarily as a groundcover for their attractive foliage. In regions with cold winters, lamium is deciduous. In milder climates, it is semi-evergreen. In either case, cut back shabby foliage after the first frost to make way for new growth in the spring. In midsummer, after the blooming period is over, prune plants back by one-third to help prevent them from becoming too invasive. The midsummer shearing also encourages a second blooming period in September. Not terribly picky, spotted dead nettles do just fine in average, well-drained soil. There is no need to apply fertilizer, as this can encourage them to become too robust and invasive. 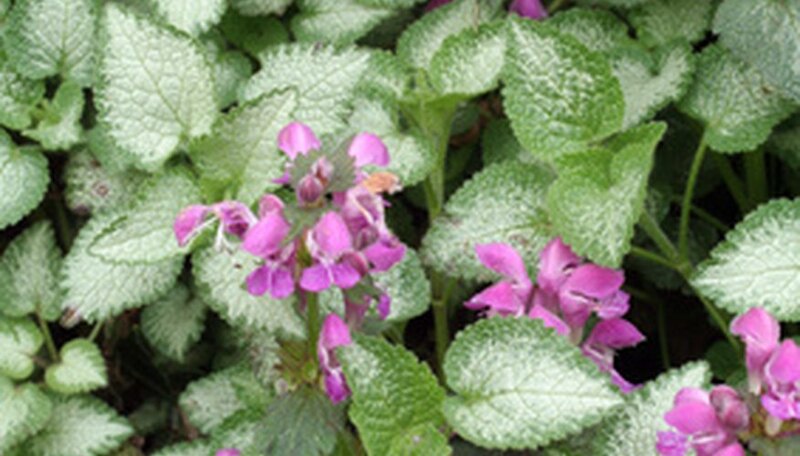 Lamium is rarely troubled by disease and is generally pest-free. Slugs and snails may be occasional visitors. Check your plants regularly and, if slugs or snails are present, handpick and dispose of them as they appear. Early mornings and evenings and after periods of damp weather are the best times to hunt for these pests. Another method of control some gardeners use is placing saucers of stale beer among their plants, with the lip of the container at ground level. Slugs and snails are attracted to the liquid, fall in and drown. The lamium cultivar known as Yellow Archangel (L. galeobdolon) is a vigorous grower and can become aggressively invasive. This trailing plant roots wherever its stems touch the soil and can quickly overrun a space. If you would like to try Yellow Archangel, planting it in hanging baskets allows you to enjoy its bright yellow spring flowers and long silver-green leaves while controlling its rampant growth habit.